From a distance the male Gadwall is a rather dull looking duck, however a closer look reveals a beautifuly patterned and distinctive bird. 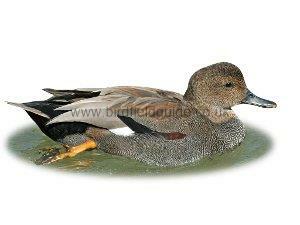 The male Gadwall is a large surface feeding duck with a small head, grey body, black stern and a pale back. It has a small white speculum. Mostly breeds in middle and Western Europe. In winter it moves to more Westerly areas. Favours freshwater lakes and large rivers which are well sheltered. In winter can be found on more open waters such as reservoirs. In summer it prefers water which is fringed by reeds. 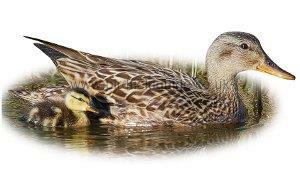 The Gadwall is a large surface feeding duck which is only slightly smaller than a Mallard. When seen up close it is a beautifully marked bird but at a distance looks decidedly dull. 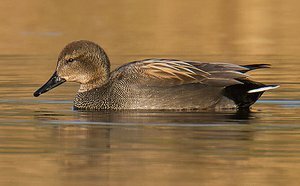 Gadwall are frequently seen to be in the company of Coots during the winter. Nice footage of a male Gadwall, joined by a female later in the video, note the bill and speculum off the female. 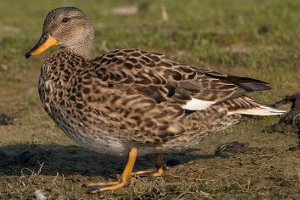 The female Gadwall is not unlike a female Mallard, however she has a white belly in flight, a white speculum and a dark bill with yellow edging. The Gadwall is slightly smaller than a Mallard. 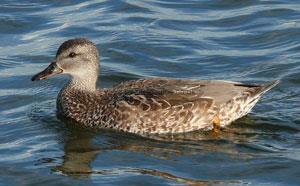 Note the white speculum and yellow edged bill on this female Gadwall. Also not the plain pale rounded head. In Summer the Male is not unlike the Female, however note the greyish patch on the rump and the darker bill.